Washington Bike Law is working with other organizations and individuals to pass presumption of liability laws for drivers who collide with pedestrians or bicyclists. Drivers of motor vehicles would be presumed responsible in the event of a collision with a pedestrian or bicyclist. This law would essentially make drivers’ insurance companies pay for any damages proven unless the driver/insurer proved that the person walking or riding was a cause of the crash. Why do we need presumed liability legislation? Driving is dangerous. Being hit by a car is the most frequent cause of injury for bicyclists. Each day on average in the USA drivers kill more than 13 pedestrians. A presumption of liability would motivate those with the most power to prevent collisions to do so. We already have a de facto presumption of drivers’ non-liability: pedestrians and bicyclists are both said to “come out of nowhere” in crashes. Police, judges, and juries often take the driver’s perspective. Injured people currently have the burden to prove drivers were negligent to obtain compensation from a driver’s insurance (and even from their own car insurance if a driver is uninsured or underinsured). Negligence is the failure to exercise ordinary care. A King County jury recently decided a driver used ordinary care in failing to stop for a person in a marked crosswalk so the driver/insurer had no liability. Many pedestrians and bicyclists lose memory because of head injuries and are unable to prove what happened in a crash. A presumed liability law could do more than just help compensate injured people; it could motivate more people to ride simply because of the perception of increased safety. Studies show that more people riding makes riding safer. The law could also motivate drivers to be more careful, making our streets safer for walking and bicycling. Infrastructure improvements are helpful, but require money and time; the law can be changed as soon as we have the political will to update our rules of the road. Drivers are strictly liable or presumed liable in places where the infrastructure is also safer for pedestrians and bicyclists including Belgium, Denmark, France, Germany, the Netherlands, Sweden, Spain, and Switzerland. Iceland, which has little bicycle infrastructure, has strict liability for drivers. What’s the difference between strict liability and a presumption of liability? Strict liability means a driver is automatically at fault. An injured pedestrian or bicyclist only needs to prove that damages are related to a crash. A presumption of liability means a driver is assumed to be at fault, but can be found less responsible or even fault-free with evidence that a pedestrian or bicyclist contributed to a collision. Can we actually pass legislation creating a presumption of liability? Yes, we can! Washington has had strict liability for dog bites since 1941: “The owner of any dog which shall bite any person … shall be liable for such damages as may be suffered by the person bitten, regardless of the former viciousness of such dog or the owner’s knowledge of such viciousness.” RCW 16.08.040(1). Far more people are injured or killed by cars than by dogs, and car insurance is mandatory in Washington. Washington recently legislated a “prima facie presumption” for Hanford workers that certain conditions are occupational diseases, but the “presumption of occupational disease may be rebutted by clear and convincing evidence.” RCW 51.32.187. King County trail use rules include a presumption of liability: “Travel at speeds in excess of 15 miles per hour shall constitute in evidence a prima facie presumption that the person violated this section.” KCC 7.12.295(A). It is a well-established in the common law that, in the absence of an emergency, the following driver is prima facie negligent if that driver runs into the vehicle ahead. Vanderhoff v. Fitzgerald, 72 Wn.2d 103, 431 P.2d 969 (1967); Miller v. Cody, 41 Wn.2d 775, 252 P.2d 303 (1953). New York legislated a “rebuttable presumption [for drivers who collide with pedestrians or bicyclists] that, as a result of such failure to exercise due care, such person operated the motor vehicle in a matter that caused such physical injury.” NY VAT § 1146. Presumed Liability would allow drivers (and insurers) to prove that a pedestrian or bicyclist had fault for a crash. It is not strict liability and would not apply to criminal prosecutions, only to civil claims. Presumed Liability Legislation could include the same presumption against bicyclists who collide with pedestrians. This would avoid “war on cars” rhetorical attacks. The goal is not to punish people who drive, it is to have safer streets for everyone. 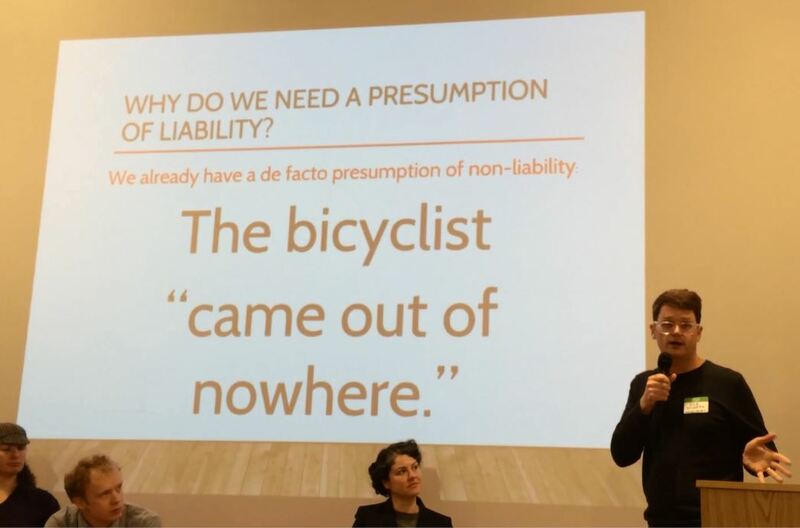 Join the Presumed Liability Working Group by emailing kimberly@washingtonbikelaw.com. Talk about #PresumedLiability on Social Media. Tag your City and State representatives and ask them to sponsor legislation creating a presumption of liability. 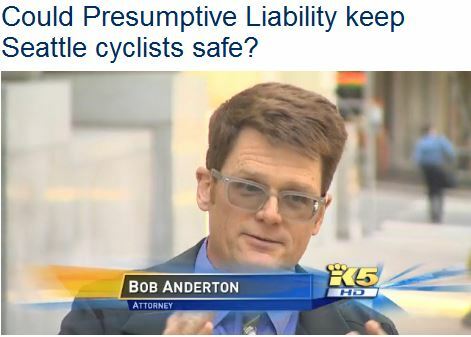 Seattle’s King 5 News did a story a few years back on presumption of liability for drivers who collide with pedestrians or bicyclists. The Washington Defense Trial Lawyers, are apparently concerned about a presumption of liability law, according to a law firm with ties to the organization. Note that the motto of the Washington Defense Trial Lawyers (or WDTL) is “Fighting for Justice and Balance in Civil Courts”… because too much justice can be a problem for the insurance companies WDTL lobbies for. In other words, instead of legislation that could motivate drivers to avoid collisions with pedestrians and bicyclists, the WDTL firm suggests requiring pedestrians and bicyclist buy no-fault insurance to protect themselves against the inevitability of being run-down by an inattentive driver. That’s not Vision Zero, that’s zero vision. This over-simplified argument against a presumption of liability ignores the motivation to pay attention that would come with updating and clarifying our rules of the road to protect vulnerable pedestrians and bicyclists. Washington Bike Law’s Bob Anderton has been advocating to make our streets safer for everyone for many years. Unfortunately, our rules of the road still favor maximizing car speeds over safety. Here is an article Bob wrote for the King County Bar Bulletin in 2009. If you have ideas on how to make our streets safer for everyone, let us know.